Living in South Africa I could not continue to post about the wildlife and all that's offered in the natural world here without posting about one of South Africa's most famous animals synonymous with the country; the Springbok (Antidorcas marsupialis). The South African ruby union team, called the 'Springboks' have the Springbok emblem of this most agile of animals, along with another well known part of the flora and fauna of the country the 'Protea' flower sewn into their shirts. The 'Springbok' like the national rugby team are athletes of note. These medium sized antelopes have colouring which consists mainly of a pattern of white, reddish/tan and dark brown, with adult males or 'rams' standing about 80 cm tall (30 in) and about 190cm (72in) in length. Springbok can reach speeds of up to 100km/h (60mph) and leap 4m (13 ft) through the air which I think you will agree is quite a feat for such a small mammal. Unlike many antelopes, Impala for instance, both the ram (male) and the (ewe) female Springbok have horns which average about 35cm (14 in) in length. Springbok are also well known for what is known as 'pronking' or 'stotting' which comes from the Afrikaans meaning to 'boast' or 'show off'. The Springbok (Antidorcas marsupialis) with Marsupialis (Latin: marsupium, meaning "pocket") this word being derived from a pocket-like skin flap which runs along the middle of the Springboks back from the tail onwards. This 'marsupium' is best demonstrated when the male Springbok perhaps wants to attract a mate or to ward off any predators, he starts off with a stiff-legged trot, jumping up into the air with an arched back every few paces and lifting the 'flap' along his back. Lifting the flap causes the long white hairs under the tail to stand up in a conspicuous fan shape, which in turn emits a strong scent of sweat. 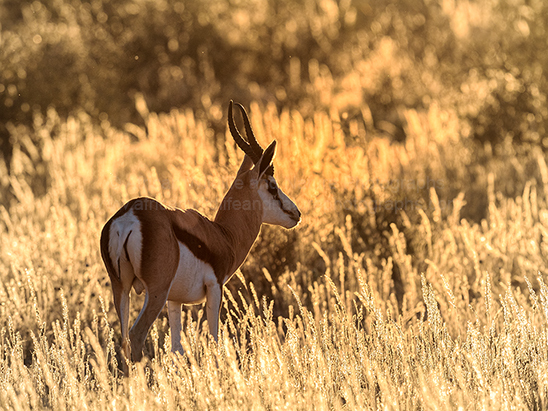 Springbok are inhabitants of the mainly dryer parts of south and south western Africa notably in the 'Kalahari' desert in Botswana and the 'Namib' desert of Namibia but also the vast grasslands of South Africa's Free State. Interestingly Springbok are 'mixed' feeders switching between 'browsing' and 'grazing' and by doing this Springbok can meet their water needs and can survive without the need for water over long long periods.